» How does magnesium lower blood pressure levels? How does magnesium lower blood pressure levels? The importance of mineral magnesium can’t be underestimated for a healthy and strong physique. 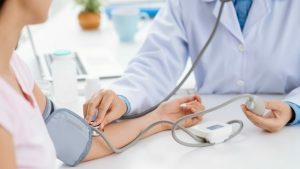 Here let us find out the relationship between elevated blood pressure levels and how does magnesium help lowering your elevated blood pressure levels? What is an elevated blood pressure level? If your blood pressure reading is less than 120/80 mmHg you have a normal blood pressure level. But, if your readings are over this range you have an elevated blood pressure level. It is a condition with no visible symptoms and may result in serious health conditions if not treated. According to WHO, globally 40% of adults whose ages are above 25 years had elevated blood pressure levels. An untreated high blood pressure level could be a potential cause of heart diseases and strokes. How does magnesium help lower blood pressure levels? Magnesium is an important mineral that plays a key role in supporting our body and its vital organs in their functions. The magnesium deficiency is linked with varieties of health conditions including Alzheimer diseases, migraine headache, diabetes, cardiovascular health, hypertension, stroke. We can get magnesium from foods we eat and dietary supplements. The role of healthy and balanced diet is of utmost importance in keeping our body fit by preventing diseases. A balanced and healthy diet fulfill all the nutrient needs of our body including magnesium. Magnesium is found to have direct as well as indirect effects in controlling one’s blood pressure levels. Magnesium promotes smooth muscle contraction and expansion during blood blow, a key parameter of the regularised blood flow. Magnesium deficiency is also linked with a low serum potassium level. A low serum potassium level affects NA/K level of our body. If NA/K ratio is too high, it results in a hypertensive state. A study on hypertensive diabetic subjects with low magnesium levels favors good effects of magnesium supplementation on lowering blood pressure levels. The study was conducted on 82 adults for 4 months with the oral supplementation of 2.5 grams of magnesium chloride (equivalent to 450 mg of magnesium). The adults were 40-75 years of age. The same trial also finds that HDL or good cholesterol levels of subjects were also increased significantly. Also as per a published research in the American Heart Association, magnesium can lower blood pressure levels modestly in people who suffer from the magnesium deficiency. High magnesium levels improve blood flow which is a factor that lowers blood pressure levels. These studies and findings lead to one point that magnesium and blood pressure levels are correlated. If you have elevated blood pressure levels, you may have a magnesium deficiency. How much magnesium intake is recommended? Like other key nutrients and vitamins, the intake of magnesium should be as per RDA. According to the Linus Pauling Institute, a healthy adult man requires 400-420 mg and woman 310-320 mg magnesium every day. The good thing is if the excess magnesium is absorbed through your regular diet, it can be eliminated by kidneys through urination. However, the supplemental magnesium may show the adverse effect if the dosages are not controlled. The Food and Nutrition Board has fixed an upper limit to the daily supplemental magnesium intake to 350 mg/day. Regular health checkups can help you know your current health status. It can help you diagnose serious illnesses on time and get them treated as well. However, many of us never give time for a health checkup. It can be justified by the fact that there are many cases of undiagnosed hypertension and other diseases. Many diseases have no visible signs and may be life-threatening like hypertension. The role of a good diet in preventing diseases and strengthening your immunity is very important. If you have often elevated blood pressure levels, incorporating foods rich in magnesium can help you out. Magnesium absorbed through foods we eat promotes good health and may not have any side effects. Don't forget to share your thoughts? How are you managing your elevated blood pressure levels? The article is only for information purpose, and does not claim any treatment. An advice from a GP must be sought before applying.